The National Fire Prevention Association (NFPA) says having working alarms in your house cuts the risk of dying in a home fire in half and increases your escape time by 1-2 minutes. That may seem like a small margin, but that extra time allows you the chance to gather your family and pets and make sure everyone gets to a safe place. However, this margin is only possible if your alarms are properly connected, maintained, and installed in the right locations. Here’s what you need to know about the best ways to keep up your fire alarms. The NFPA recommends installing a fire alarm in every bedroom, outside the sleeping areas, and on every level of your home to increase audibility. 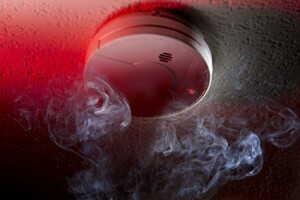 Most reported deaths due to home fires occur between the hours of 11p.m. and 7a.m. when most people are asleep. Having a fire alarm directly in your bedroom will increase your chance of hearing the sound and waking up in time to escape. With singular alarm systems, only the alarm closest to the smoke or fire will go off. This is good for quickly figuring out where the problem is occurring, but not very good for actually catching your attention and getting you to safety. Interconnected alarm systems are the most successful at warning all the inhabitants of your home because every installed alarm will go off at once when one of them is triggered. While battery alarms are the most common, the NFPA recommends hardwiring your alarms into your home’s electrical system instead. Hardwire alarms work 93% of the time while battery alarms only work 79% of the time. However, it’s important to remember to check on hardwired alarms if you ever have a power outage; your system could be accidentally turned off. Similarly, if you have battery powered alarms make sure you always have extra batteries available. A combination of the two, if possible, would be your best option. You should test your alarms to make sure they’re still functioning properly at least once a month. If your alarm does not respond when you press the small ‘test’ button, or if the alarm sounds quieter than if should, replace it immediately. Otherwise, alarms should be replaced once they are ten years old. There are different alarm systems available for those who are deaf or hard of hearing. These alarms utilize flashing strobe lights to catch your attention, and some even shake your bed to wake you up if you’re asleep. If you have a hearing disability, we recommend you look into installing one of these alarms instead. For more information on fire safety and prevention, go to the NFPA’s Fire Prevention Week website or visit 911 Restoration.